At Last…business Access Control Turnstiles done properly! You’ve finally found the security company that can provide the very best in business Access Control Turnstiles – no matter what your objectives, we can assess, design, install and maintain the highest quality Commercial Turnstile systems to protect you and your organisation. Whatever level of protection or prevention you need, we’ll ensure that your security turnstiles exceed your expectations. You’ll receive honest and transparent advice to ensure you get the very best Turnstile Access Control system for your premises, giving you complete control over your operation, staff and visitors. During your free site visit, survey and assessment, our consultants will take the time to understand what security success looks like for your operation, to create a robust and reliable bespoke solution – whether you operate from single or multiple sites. Improving existing systems: We can modify your Turnstiles with the latest technology or replace them to meet your specific security goals and to provide greater reliability. While some products suit more industrial applications, as experienced Security Turnstile manufacturers, we can design more aesthetically appropriate systems if you need Access Control in a more ‘front-facing’ environment. 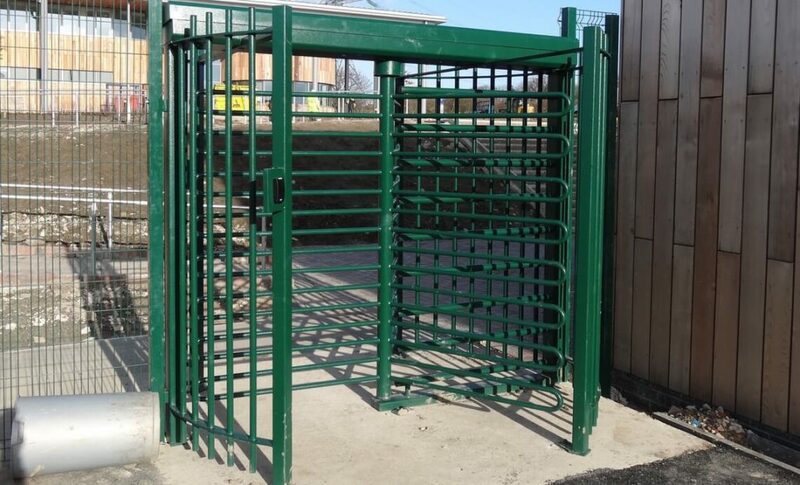 Take a look below at the different types of Turnstiles we can offer, along with some of the fantastic features, capabilities and benefits that will bring you the highest standards of access and incident protection and prevention. Full Height Turnstile systems are generally used in more industrial environments and can be located at the perimeter entrance or to separate different high-risk work zones. These Turnstiles can be powder coated according to your brand colours, and you can choose to have the bars in a different colour to the housing. For external applications, they’re also hot-dip galvanised to ensure they can cope with changing weather conditions. Made from stainless steel, these are also known as tripod Turnstile systems or Waist Height Turnstiles, and are often found in large offices, train stations, government buildings and other business premises where a less visually intrusive but secure system is required to control access. Single Turnstiles are suitable for areas with a low pedestrian volume, whereas for busier areas, a double system – two Turnstiles with one central mechanism – is often more appropriate. This variant has 120° arms with 3 bars and provides more space for larger framed people to pass through with ease. This variant has 90° arms with 4 bars, giving a smaller area to pass through, but reducing the potential risk of 2 people squeezing through the Turnstile together, thereby bypassing Access Control checks. All Full Height and Half Height single or double Turnstiles can be installed as a one-directional (entry or exit only) or bi-directional (entry and exit) system. Your commercial Turnstile system can be fitted with a wide range of Access Control capabilities for additional security and to automatically create auditable logs – options include proximity readers, keypads, intercoms or biometrics such as finger print recognition. For ease of exit, we can install a push-to-exit button or activate a free-flow exit option via a movement sensor. All Turnstiles also come with a ‘break glass for emergency exit’ contingency. If you work in these industries, we can provide stainless steel versions of any of our Turnstiles for hygiene and environmental protection. You may want us to design your business Turnstile system to include a Pedestrian Gate in the centre or to the side, in order to allow access to disabled users, visitors that need to be given manual (rather than automatic) access via an intercom and CCTV, or for large or bulky deliveries or goods moved via sack carriers etc. For Half Height Turnstiles, we can provide an automate glass wing/door as an alternative. Many businesses ask us to connect their Turnstiles to their Fire Alarm/evacuation system, so that in an emergency, the Turnstiles automatically switch to free-exiting for fast exit away from the risk. You also have the option of LED direction/status indicators (much like a red and green Traffic Light system), and we can also build lighting into the Turnstile heads for outdoor applications where ambient or other lighting is insufficient. We’re more than just Security Turnstile manufacturers – we can provide all electrical and civil works too, for a smooth and efficient installation. We’ll repair any existing commercial Turnstile system and also offer cost effective maintenance packages and system takeovers to provide you with superior service. Turnstile systems allow you to prevent unauthorised access to your site at the perimeter, or control access to different parts of your building or warehouses – no manual checking required. Many large businesses integrate their Turnstiles with commercial Access Control capabilities to reduce HR headaches, creating automatic auditable logs for attendance and time-keeping management for payroll purposes. Your HR department always knows who’s on site, with demonstrable evidence of who was present in the event of any theft or damage. Turnstile Access Control systems are perfect for keeping tabs on temporary staff, agency workers and contractors – as well as permanent employees – helping you to calculate wages according to attendance and avoiding the potential for someone else to clock in on their behalf. Commercial Turnstiles can be an essential line of defence to protect your people, products and premises for improved peace of mind. We have many clients in the food production, warehousing and manufacturing sectors who rely on their Turnstile systems to protect high value inventory and machinery, and to prevent visitors entering parts of the building where they are not allowed to be. If you handle hazardous or dangerous materials in your business, Turnstiles can mitigate the risk of unapproved personnel entering these sensitive areas and provides evidence of those present if you need to investigate any health and safety incidents. Manually checking every visitor or staff member throughout the site is a logistical nightmare, and costly too. Modern Turnstile systems reduce the requirement for security staff and decrease thefts and potential accidents, ensuring a solid return on your investment. A commercial Turnstile system allows you to demonstrate that your premises are protected and monitored, ensuring product, stock and machinery can’t be interfered with or easily stolen, which is great for insurance and health and safety purposes. They’ll also help you to comply with British Retail Consortium (BRC) standards, GDPR and Quality Assurance. Your turnstiles can be fully integrated with many other access control solutions, helping you to build a robust and comprehensive security network powered by sophisticated software. While these systems can be pretty complex, we simplify the process by dealing with all the technical elements directly with your IT department to ensure an efficient and reliable installation. We’re happy to utilise your current IT model, including Cloud access for monitoring and management while on the move, and can integrate any existing or new products in one professionally managed project. You’re sure to have lots of questions about how a Commercial Turnstile system can help your business, and to ensure you choose the right supplier – so we’re happy to be put in the firing line during a face-to-face meeting, where you can ask us all your questions so we can address and overcome any concerns. We offer flexible leasing on every Turnstile Access Control system, helping you manage your cash flow, increase tax efficiency, fix your costs and ensure you have the best and latest equipment. You need to know that any data traffic and software integrated and introduced to your network is safe and secure. We won’t expose your business to cyber risk, and our team here at TI Security will work in conjunction with your IT specialists.